These are quite major falls for stocks which were supposed to be unstoppable in terms of their market advances. Of course, their supporters could say it was just a healthy correction and a “buying opportunity”. And they might add that so far, other “story stocks” such as Alphabet, Apple and Amazon are still doing well. But others might say a paradigm shift is underway, and these sudden shocks are just the early warning that the central banks’ Quantitative Easing bubble is finally starting to burst. Netflix is another “story stock” now seeing a downturn in subscriber growth. Yet at its peak it had a market value of $181bn, with net income for this quarter forecast by the company at just $307m. Like Tesla, it was valued at a higher value than comparable businesses such as Disney, which have had solid earnings streams for decades. The common factor with all 4 stocks is that they have a great “narrative” or “story”. Elon Musk has held investors spellbound whilst he told them of unparalleled riches to come from his innovation. This seemed to be the same with Facebook until the furore arose over the data user scandal with Cambridge Analytica. Twitter and Netflix have also had a great “story”, which overcame the need to show real earnings even after years of investment. Even the European Central Bank and the Bank of Japan have signalled they might finally be about to cut back on the combined $5.75tn of lending, often at negative rates, that they pumped into the markets between 2015 – March 2018. The issue is simple. All bubbles need more and more air to be pumped into them to keep growing. Once the air stops being added, they start to burst. 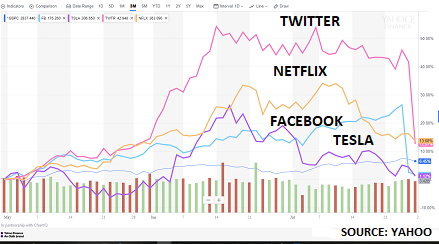 And for the moment, at least, Facebook, Twitter, Netflix and Tesla are all acting as the proverbial canary in the coal mine, warning that the great $33tn Quantitative Easing bubble may be starting to burst. The post High-flying “story stocks” hit air pockets as credit finally tightens appeared first on Chemicals & The Economy.